This topic is a very discussed one. Obviously, with all subjects that are discussed a lot, different opinions and “facts” will be presented which will make it more difficult to understand when the best time to post on Instagram really is. Thankfully, we have a special trick up our sleeve that will give you the answer to this question. 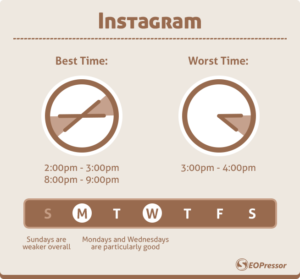 The time you post a post on Instagram can have a huge effect on how it performs. Why does the time you post matter? The answer is quite simple, really. Your followers won’t be active on Instagram all the time. Therefore, you want to make sure you make a post when most of your audience is online because obviously, more people will see it. The more people who see your post, the more people will like and engage with it. And if it’s a marketing post, the more people will see it and perform the action you’d like them to do, for example visit your website. Knowing when to post is still important, however, the importance of when to post is not as important as it used to be. The reason to that is Instagram algorithm. Before the algorithm, the feed was presented in a chronological order meaning the most recent posts at the top and the oldest posts at the bottom. Simple. As a result, if you posted at a time when your audience wasn’t online, there’s a chance that a lot of other people that your audience follow shares content, bumping down your post. In worst cases, it could mean that your post ended up so far down in their feed that nobody gets to see it. Thus making the time you posted extremely important to even get your posts seen. But now, the reality looks completely different. The content in your feed is now decided on relevance with the help of Instagram’s algorithm. In short, Instagram’s algorithm decides what they think you will like based on your previous engagements. This means that posts in the top of your feed can be several days old, while content that is only minutes old is presented far down in your feed. So should you ignore posting times? The algorithm does not mean that you should completely ignore the time you post. Choosing a time when most of your audience is online can still help you gain more views and a higher engagement and in this guide, you’ll learn how to increase the engagement on your post in no time by simply changing the times you are posting. As mentioned before, statistics present different “best times”, and that’s because their studies have found the results to be different. This can depend on things like where their audience is from, what their age is and so on. Does the fact that many stats say different times mean that you should completely ignore them? Co-schedule says that Mondays and Thursdays are the best days to post and that 2 am, 8-9 am, and 5 pm are the best times to post. SEO professor has found that Mondays and Wednesdays are particularly good and that 2-3 pm and 8-9 pm makes for optimal engagement. Already, we can see that the statistics differ a bit. Faceblift-bbt says that 7 am – 9 am, and 4 pm – 6 pm are the best times to post, without mentioning any “best day”. As you can see, the statistics vary. Depending on where your followers are based, the times can vary a bit, but overall, there are generally good, bad and best times to post on. The times listed above are times when it’s (according to several studies) best to post – referring to likes, comments, reach and impressions. By strategically choosing when to post a photo, you’ll increase your engagement and reach. By strategically choosing at what times to make a post on Instagram, you can increase your engagement in a heart beat. Let’s go into the “secret tip” that I spoke about earlier. The secret tip is quite logical, but still, too few people are using it, and are relying on the statistics they are presented with to choose the time to post. The answer and real truth to when you should post for optimal engagement on Instagram is: it depends! And a few other reasons as well. Because no Instagram page has the same followers, there’s no question that the times you should post varies. If most of your followers are from Europe, of course, you will have a different best time as opposed to having a majority of followers from the US. Now that we’ve sorted out the fact that it depends, we can look at how you can figure out your best time. Before Instagram Insights, figuring this out was really hard, to say the least. Thankfully, Instagram has blessed us with Instagram analytics that lets us figure this out. If you haven’t converted your account into an Instagram business account, you need to do so in order to get access to Instagram analytics. Once you’ve done so, go to your profile and tap the Analytics icon in the top right corner. Scroll down to “Followers“, then tap “See more“. Scroll down to the bottom of the page where you’ll see “Followers. In this section, you can you can swap between “Hours” and “Days”. As opposed to many tend to believe, this is not the times when you receive the most followers. Instead, it is the times when your followers are accessing the Instagram app the most (and the least). As we talked about in the beginning of the article, you want to post content at times when your audience is most active on the platform, and this metric is super valuable to understand that. You can also scroll between all days of the week and see the difference in the time on different days. 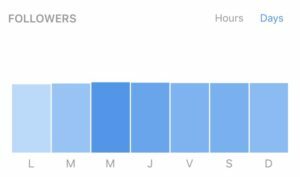 As you can see on my stats, my followers are most active on Instagram on Wednesdays and Thursdays, and at 18- 21 pm on Mondays. 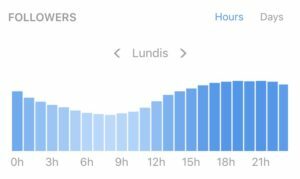 While statistics can be super helpful in getting an idea on when to post, there’s not much that beats the good old experimenting and trying and having Instagram Insights at your disposal. Because the reality is that no page is the other one like, and you should choose times to post accordingly – by not looking at others. Instead, focus on your own page and your own audience.